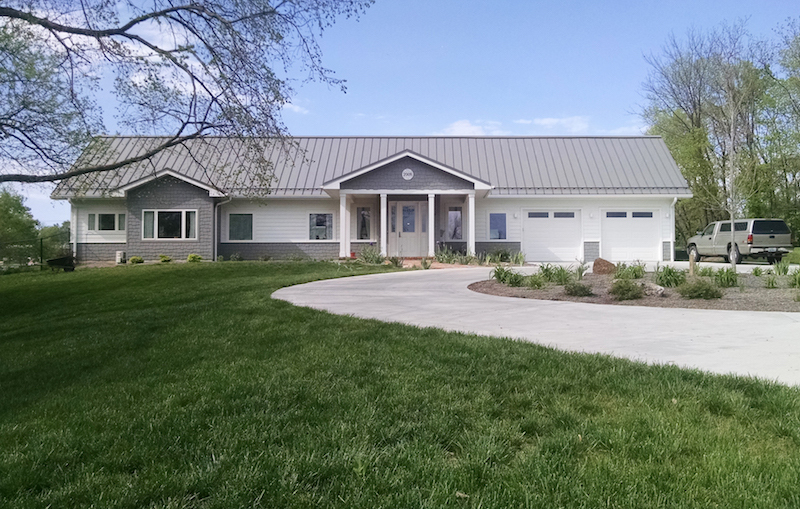 Peckham Architecture’s LEED Platinum home headquarters in Columbia, Missouri, uses ductless heating and cooling and HRV (heat recovery ventilation) to maintain clean, comfortable indoor air. These tools contribute to net-positive energy: Our green building produces more energy than it consumes. During the hottest May on record (2016), we earned a negative electric bill (-$176)! Yet many Americans still don’t know about these technologies. Ductless heating and cooling is, by definition, far more efficient and flexible than typical ducted systems. In the video below, Jamie Callahan of Columbia-based Air & Water Solutions talks about our Mitsubishi Electric ductless heating and cooling system, also known as a mini split. Our green building is sealed and insulated to the point of being airtight, which poses unique ventilation challenges. The Zehnder HRV system was custom designed for the needs of this house. “With this house being so tight, you have to control moisture, smells, VOCs,” Callahan says. The HRV system replaces the stale, humid indoor air with fresh air from outside. Inside the energy recovery core, energy from the “old” air heats the incoming “new” air to nearly the same temperature before distributing it in the home. This creates constant indoor climate stability. In the video below, green building expert Dave Horton uses a thermal imaging system to detect heat transfer in our eco house. Buildings are full of thermal bridges, or areas where energy typically escapes: the slab foundation, doors and windows, walls and ceiling, and the roof. Luckily, green building insulation can dramatically reduce heat transfer. This is one time when boring is best—Horton’s thermal imager showed very little activity. Make your new construction or renovation deep green. Peckham Architecture offers prospective clients a free initial meeting of up to 1 hour.